Those who have been football supporters all their lives can never forget the first match they ever saw, although they might not recall the result. This is because it is the players that stay in the memory and the magic moments they provided for millions of spectators in their time.Every generation throws up its own football field magicians and The Scottish Football Hall of Fame encapsulates the Saturday afternoon spell cast by fine footballers for ordinary working men who lived to cheer on their heroes every week. Fervour was passed down from father to son, and in this way the future of the clubs as well as the fame of a few golden greats was guaranteed. Players like R.S.McColl (Queen's Park), Bobby Walker (Hearts), Alan Morton (Rangers), Denis Law (Manchester United) and Kenny Dalglish (Celtic) are in this pantheon, and they span the arc of Scottish football from its earliest days till modern times. These, and more than a hundred like them, are the men you will read about in these pages. Men who were once household names are captured here in their sporting immortality and introduced to generations of football enthusiasts who never saw them play. 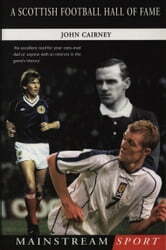 The Scottish Football Hall of Fame gives a unique overview of the beautiful game, where by means of illuminating narrative and anecdote, legend can unite with historical fact to honour not only the wearers of the famous dark blue shirt but every foot-soldier in the Tartan Army who has ever shouted 'Scotland! Scotland!' from the terraces.